MoreOur law practice is built on delivering partner-level attention and unfaltering dedication to serving you, our client. You can rely on us to be approachable, responsive and efficient. We will provide you with personalized legal representation based on your background, needs, and objectives. We respond promptly to your telephone calls, report regularly on your case, and minimize any risk to you by staying on top of changes in the law and medicine. By specializing our practice, we can assure you...Our law practice is built on delivering partner-level attention and unfaltering dedication to serving you, our client. You can rely on us to be approachable, responsive and efficient. We will provide you with personalized legal representation based on your background, needs, and objectives. We respond promptly to your telephone calls, report regularly on your case, and minimize any risk to you by staying on top of changes in the law and medicine. By specializing our practice, we can assure you the highest quality representation. At our law firm, you aren't a number and don't get shuffled around. Many of our clients keep in touch with us well beyond the handling of their case. The relationships we maintain with our clients are valuable and important to us. Because of our reputation in the legal and medical community, we are taken seriously. With a doctor and a lawyer on your side, defendants are more likely to settle, and for larger dollar amounts. 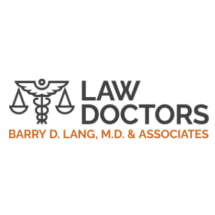 We settle virtually all of our cases, not only because of Dr. Lang's medical background, but because we pay attention to every last detail of your case. If defense counsel insists on taking a case to trial, we are ready, willing and able to pursue your case as aggressively as necessary. For unequaled review and representation of your medical malpractice and personal injury case, select the law firm with a medical doctor/attorney whose medical knowledge and experience is combined with a top-notch litigation team with a track record of proven success. Lang, M.D., J.D. (deceased), Barry D.